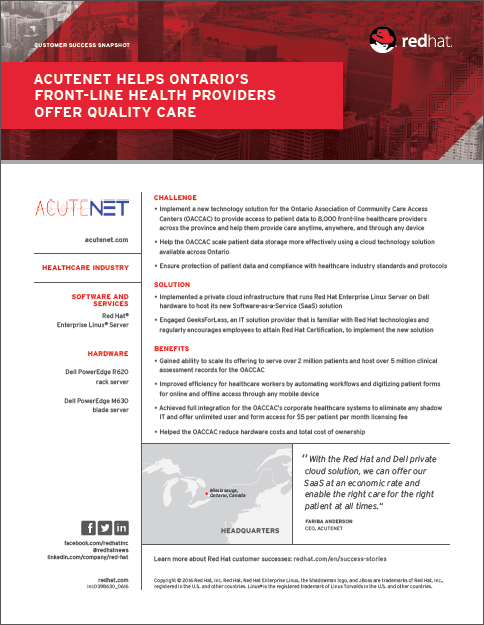 AcuteNet, a Red Hat partner, needed to implement a new technology solution for the Ontario Association of Community Care Access Centers (OACCAC) to improve access to patient data for front-line healthcare providers across the province. With help from GeeksForLess, an IT solution provider, AcuteNet implemented a private cloud infrastructure that runs Red Hat® Enterprise Linux® Server on Dell hardware to host its new Software-as-a-Service (SaaS) solution. As a result, AcuteNet gained the ability to scale its SaaS offering and meet the OACCAC’s corporate IT needs by improving automation and efficiency.